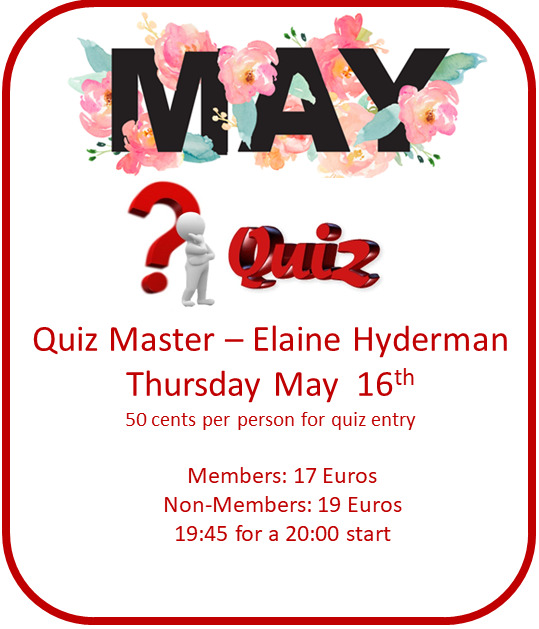 To Book for an Event or Quiz go to the Event Booking & Menu Choice or Quiz Booking & Menu Choice within the Members Section of the website. 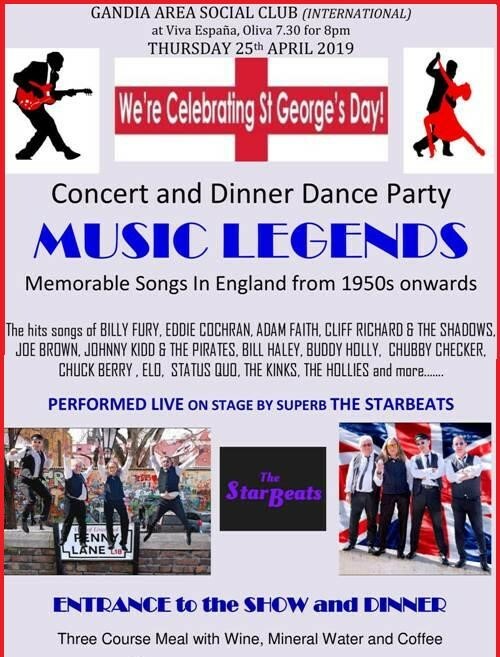 We have booked the extremely skilled and talented band The StarBeats to play for us live on stage the most memorable songs from many decades - hits in England from lots of Music legends. This will be a wonderful musical evening - Let's be proud and show it! Mama Mia, it's our 30th birthday!!!!!! Gandia Area Social Club (International). To help us celebrate this milestone we have booked a superb show direct from Benidorm, with the internationally renowned Abba Elite. 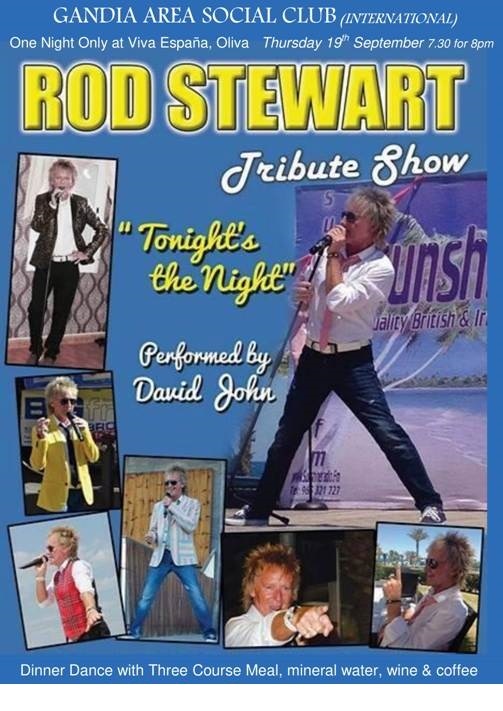 More than just a tribute band, these guys have a brilliant all singing, all dancing show to get you joining in with them. The harmonies are flawless, the costumes spectacular, the choreography breathtaking and we will get them to throw in some good old 70's disco classics for good measure. So all you dancing queens, pull on your glad rags and party shoes and come and help us celebrate. Loved by audiences of all generations, this will be a great night out for all, if you've got the family over for the half term holiday bring them along for a good old boogie! A different venue for our first Summer Quiz, with a different format to boot! 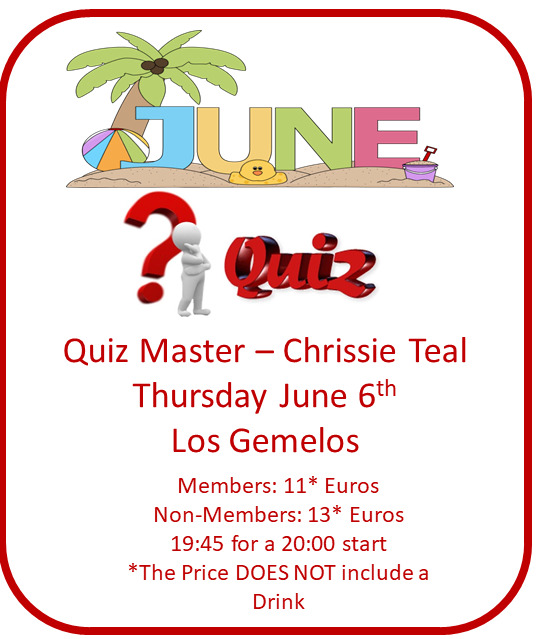 Tara and Glen are welcoming us to Los Gemelos for the first time and are tempting our palates with a very British Buffet - the sumptuous feast is listed on the menu pages, but there is nothing to choose from, just help yourselves on the evening. Thursday 20 June 2019 - . 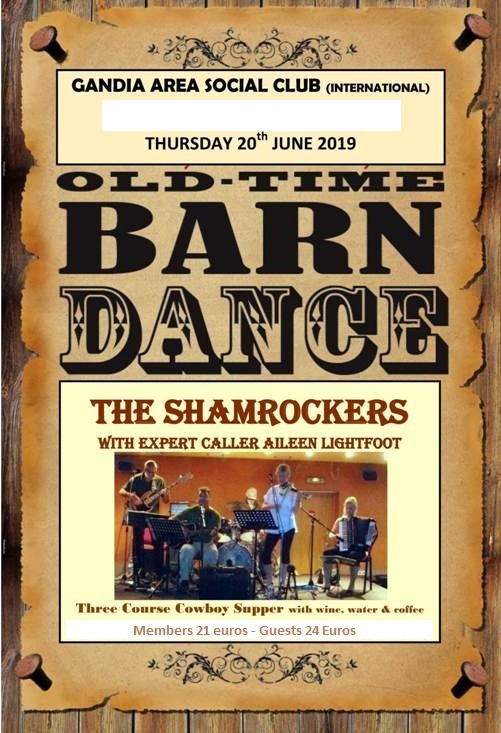 We have had numerous requests for another Barn Dance and are delighted to say that we have The Shamrockers band together with the expert caller Aileen Lightfoot booked. We do hope that many, many members will be there to have a go at this hilarious activity. Its great when you get it right, its great when it goes horribly wrong! So, find those boots, put on that check shirt, denim jeans and a hat and see you there! Thursday 4 July 2019 - . Phil Brown will be Quiz Master this evening. Although Phil is a member of GASC this is the first time he will have hosted a quiz. As an American and with this quiz falling on July 4th I'm sure it will be fabulous. Thursday 18 July 2019 - . 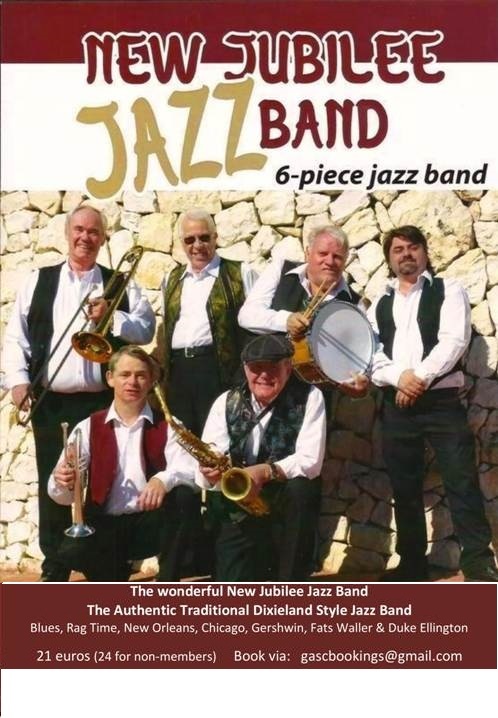 We are delighted to announce the musical entertainment for our Summer Event will be from the brilliant New Jubilee Jazz Band. They will play for us a wide range of compositions Dixie, Rag Time,New Orleans and much more. Book early to be sure to enjoy the delicious food on a sunny day full of the rhythms and warm sounds of clarinet, trombone, double bass, trumpet ....... It is a MUST! Thursday 1 August 2019 - . Thursday 29 August 2019 - . Thursday 19 September 2019 - . We are delighted to announce that David John will be back with us. His show in March 2018 was fabulous and hugely enjoyed by the 170 at Viva Espana. We are sure that David will give us another terrific evening with all the songs Sir Rod has made so famous, memorable and sing-a-long. Do not miss this evening. Sit and watch or take to the dance floor, but make sure you are there! Thursday 31 October 2019 - HALLOWEEN .. The Ace Band concert promises to be a highlight of the year as there is nothing quite like excellent live music and the Ace Band give us that. We will again have music from the terrifically skilled Danny McRae. Come and enjoy the party with friends old and new. Join in with the fun or sit back and people watch! The music will be superbly presented by Rae and Ricky. They are incredibly skilled with their guitars and harmonies - a quality of sound that you may have thought only Don and Phil Everly could achieve. But also individually they have the voices and ability for the romantic tones of Roy Orbison and the energy of those lively, memorable Buddy Holly songs. What other activities would you like ? The Committee would like to remind members of the dress code for the Thursday evening dinners. Smart Casual Wear, no Shorts, Vests or T-shirts. However in the months of June, July and August smart shorts will be acceptable. Also: all outside events and activities are undertaken at your own risk.